In general, only six individual thrusters are required to perform 6 DOF (Degree Of Freedom) motion. Sometimes, however, more than six thrusters are used for 6 DOF motion for a variety of purposes. The over actuated systems can transit quickly from transient state caused by disturbance to steady state through the over actuated input. So in the underwater robot, the purpose of over actuated system is mainly used to maintain stable motion and position. And that systems are performed to obtain the optimal efficiency through the thruster force distribution. In this paper, we designed and fabrication the ROV (Remotely Operated Vehicle) for the basic study of over actuated underwater robot. It has 4 horizontal thrusters and 4 vertical thrusters. Using this system, we derived the thruster force distribution matrix for thruster allocation. Also, to check the kinetic characteristics of over actuated underwater robot before applying various controller, we performed the basic motion performance test and motion control test using the PD controller in the indoor engineering water basin. B. 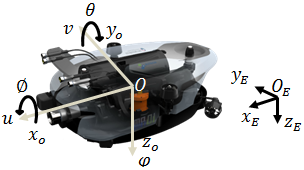 He, B. R. Wang, T. H. Yan, and Y. Y. Han, “A distributed parallel motion control for the multi-thruster autonomous underwater vehicle,” Mechanics Based Design of Structures and Machines, vol. 41, no. 2, pp. 236-257, February 2013. R. D. Christ and R. L. Wemli Sr, The ROV manual:a user guide for remotely operated vehicles, 2nd ed. Butterworth-Heinemann, 2013. T. I. Fossen, T. A. Johansen, and T. Perez, A survey of control allocation methods for underwater vehicles, InTech, pp. 109-128, 2009. T. I. Fossen, Guidance and control of ocean vechicles, New York: John Wiley & Sons Inc, September 1994. D. H. Kim, Redundancy resolution and robust controller design for dynamic stability enhancement of underwater vehicle-manipulator systems, Doctorate Thesis, Korea, Graduate School of Department of Mechanical Engineering, 2016.